Explore in Google Docs, Sheets, and Slides to give you the insights, design tools, and research recommendations you need to do your best work. Today, we’re improving upon the feature by allowing you to easily cite those findings. Students writing research reports, analysts crafting whitepapers, and others looking to credit their sources can now insert citations as footnotes with the click of a button in Explore in Docs on the web. You can even change the format of your citation, switching between the MLA, APA, and Chicago styles. For more information on how to use citations in Docs Explore, check out the Help Center. With the addition of citations support, we’re now ready to launch Explore in Docs to G Suite for Education customers on the Scheduled release track. That rollout will begin tomorrow, December 6th. In September 2016, we launched Explore in Google Docs, Sheets, and Slides to give you the insights, design tools, and research recommendations you need to do your best work. Today, we’re improving upon the feature by allowing you to easily cite those findings. 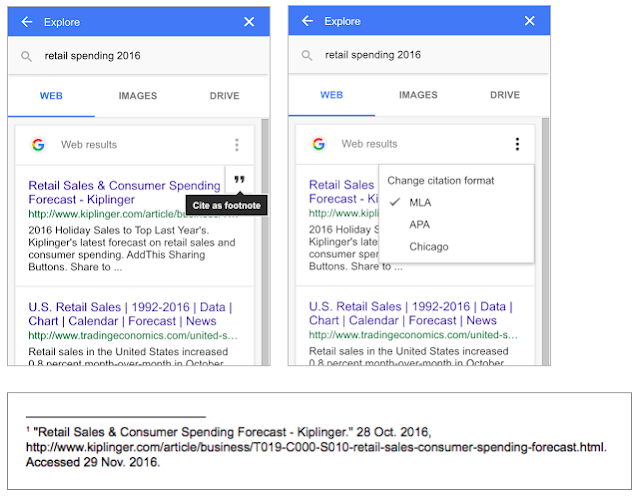 Students writing research reports, analysts crafting whitepapers, and others looking to credit their sources can now insert citations as footnotes with the click of a button in Explore in Docs on the web. You can even change the format of your citation, switching between the MLA, APA, and Chicago styles. For more information on how to use citations in Docs Explore, check out the Help Center.